I’ve been out of the house all freakin’ day. This is alternately good and scary. Scary, because I’m almost never out of the house all day (which in and of itself is scary), and good because, well, I’m not inside at the computer. The day started out with seeing a horrible horrible terrible awful huge spider. :eyepop: I hate spiders. Loathe them. And this one was gigantorly huge and menacing and all creepy on its web and I panicked. Ew. I thought it was going to kill me. Daniel had to go to work to pick up his paycheck and then we were going to go to the bank to deposit it. I had to deposit that check from my school as well. We left the house and then had to come back about a minute later because I totally forgot the check at home. :lookup: Yeah, I’m an honor student. We went to a few music stores and I ended up finding a used copy of the soundtrack to Hedwig and the Angry Inch! :chubbysmile: Actually, Daniel found it for me, but still. I have it! It was only $9 as opposed to like, $17.99 new, which is awesome. Hurray! My 6pm class went well, mostly because the teacher was sick and we got to go home early. So the first two weeks have been wholly unproductive. For a class that I didn’t even want, it hasn’t been too bad. Microsoft Project appears easy enough to pick up, but the teacher is treating it like it’s this horribly confusing interface that you probably won’t ever learn. I mean, it’s not like Gantt charts are the easiest thing in the world, but he’s making it seem much more daunting than it actually is. I took a bunch of pictures :camera: of those weird pink dudes on the stickers. I don’t know why I like them so much, but I think it’s the mystery that surrounds them. I have no idea who’s putting them up or why, or where all of them are, or what they mean. It’s like a secret code or something. I got the idea to make a section on my photography page just for the pinky pictures. OHMYGOD I could make a pinky SMILEY!!! Greatest idea EVER. Life’s lessons learned from stickers on posts. 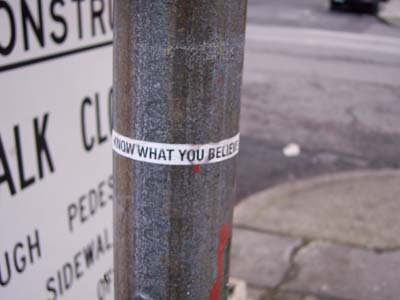 Know what you believe in. I apologize for the glare. I took the picture at night and HAD to use the flash. I have no idea who Bobby Flay is, but this is still funny. This one’s eyes are sorta weird. I think I should have just taken the sticker. It would have been less wrinkly.